Only days after Newsweek was embarrassed when its own columnist, Robert Samuelson, excoriated the magazine for a "fundamentally misleading" and "highly contrived" cover story meant to defame the global warming "denial machine," Wednesday's NBC Nightly News aired an equally distorted story which smeared "deniers," a term no doubt meant to conjure a similarity to dishonorable Holocaust deniers. Reporter Anne Thompson began her crusading piece with "In Denial" on screen over video of the Cato Institute's Patrick Michaels. She fretted about "interest groups fueled by powerful companies, including oil giant ExxonMobil." Citing the far-left Union of Concerned Scientists, she highlighted their claim that "ExxonMobil gave almost $16 million over seven years to denier groups, including the Competitive Enterprise Institute." 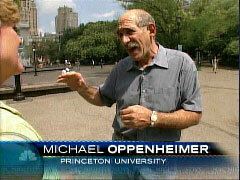 Touting Michael Oppenheimer as an expert, whom NBC identified only as an "atmospheric scientist" with Princeton University, Thompson asserted that "climate experts say whether hired guns or honest dissenters, deniers are confusing the issue and delaying solutions." Thompson concluded: "The scientific debate is no longer over society's role in global warming. It is now a matter of degrees." Katie Couric found it newsworthy Wednesday night that former Secretary of Defense Donald Rumsfeld's resignation letter from nine months ago did not include the words "war" or "Iraq." Picking up on a story from the Associated Press on how "the deadly and much-criticized conflict that eventually drummed him out of office comes up only in vague references" in the November 6, 2006 letter the AP obtained by filing Freedom of Information Act requests, Couric failed to credit the AP as she relayed this brief item on the CBS Evening News: "There's news tonight involving the former Pentagon chief. Donald Rumsfeld's resignation letter has surfaced and it's notable for what it doesn't contain. Rumsfeld refers to 'a critical time in our history' and a 'challenging time for our country,' but the two words he doesn't use? 'War' or 'Iraq.'" In an e-mail to his staff, Seattle Times Executive Editor Dave Boardman reported that in Monday's news meeting about planned story assignments, "when word came in of Karl Rove's resignation, several people in the meeting started cheering." In quite an understatement, Boardman scolded: "That sort of expression is simply not appropriate for a newsroom." In revealing the incident in his blog, the paper's chief political reporter, David Postman, recognized that "it sounds like a conservative's parody of how a news meeting would be run." In a follow up e-mail sent Wednesday, top editor Boardman conceded the display matched the overall politics at the paper: "If we wore our politics on our sleeves in here, I have no doubt that in this and in most other mainstream newsrooms in America, the majority of those sleeves would be of the same color: blue. Survey after survey over the years have demonstrated that most of the people who go into this business tend to vote Democratic, at least in national elections. That is not particularly surprising, given how people make career decisions and that social service and activism is a primary driver for many journalists." 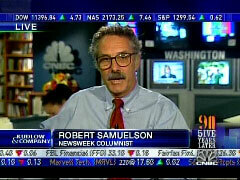 Only days after Newsweek was embarrassed when its own columnist, Robert Samuelson, excoriated the magazine for a "fundamentally misleading" and "highly contrived" cover story meant to defame the global warming "denial machine," Wednesday's NBC Nightly News aired an equally distorted story which smeared "deniers," a term no doubt meant to conjure a similarity to dishonorable Holocaust deniers. Reporter Anne Thompson began her crusading piece with "In Denial" on screen over video of the Cato Institute's Patrick Michaels. She fretted about "interest groups fueled by powerful companies, including oil giant ExxonMobil." Citing the far-left Union of Concerned Scientists, she highlighted their claim that "ExxonMobil gave almost $16 million over seven years to denier groups, including the Competitive Enterprise Institute." But as Marc Morano, of the minority staff of the Senate's Committee on Environment and Public Works, disclosed in a posting, "proponents of man-made global warming have been funded to the tune of $50 BILLION in the last decade or so," not even counting the impact of one-sided media reporting, "while skeptics have received a paltry $19 MILLION." Nonetheless, touting Michael Oppenheimer as an expert, whom NBC identified only as an "atmospheric scientist" with Princeton University, Thompson asserted that "climate experts say whether hired guns or honest dissenters, deniers are confusing the issue and delaying solutions." Oppenheimer, who NBC failed to note is "science adviser" to the left-wing Environmental Defense organization, ominously warned: "This is a problem that needs to be attended to very soon, immediately, or else it threatens to get out of control." Thompson's conclusion echoed: "The scientific debate is no longer over society's role in global warming. It is now a matter of degrees." "NASA has now silently released corrected figures, and the changes are truly astounding. The warmest year on record is now 1934. 1998 (long trumpeted by the media as record-breaking) moves to second place. 1921 takes third. In fact, 5 of the 10 warmest years on record now all occur before World War II." 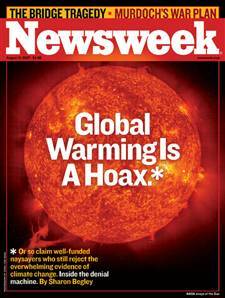 Using the term "deniers" for those who haven't bought into the media-fueled panic over global warming, a term which harkens to dishonorable Holocaust deniers, this week's Newsweek delivered a one-sided cover story broadside ("THE TRUTH ABOUT THE DENIAL") against those who dare to examine the science and fresh evidence. "Global Warming is a Hoax*" read the headline on the cover of the August 13 issue, with this explanation in the corner for the asterisk: "*Or so claim well-funded naysayers who still reject the overwhelming evidence of climate change. 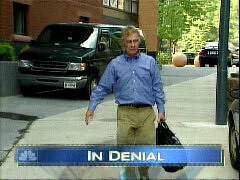 Inside the denial machine." Newsweek's thought police, Sharon Begley with Eve Conant, Sam Stein, Eleanor Clift and Matthew Philips, who employed the belittling term "denial machine" 14 times in their screed in the guise of a news story, fretted: "Since the late 1980s, this well-coordinated, well-funded campaign by contrarian scientists, free-market think tanks and industry has created a paralyzing fog of doubt around climate change." But as Marc Morano, of the minority staff of the Senate's Committee on Environment and Public Works, noted in a Sunday night [August 5] posting: "The only problem is Newsweek knew better. Reporter Eve Conant, who interviewed Senator James Inhofe (R-Okla.), the Ranking Member of the Environment & Public Works Committee, was given all the latest data proving conclusively that it is the proponents of man-made global warming fears that enjoy a monumental funding advantage over the skeptics. (A whopping $50 BILLION to a paltry $19 MILLION for skeptics -- Yes, that is BILLION to MILLION.)" And that's not counting the impact and value of the media's one-sided campaign as illustrated by Newsweek. We in the news business often enlist in moral crusades. Global warming is among the latest. Unfortunately, self-righteous indignation can undermine good journalism. Last week's NEWSWEEK cover story on global warming is a sobering reminder. It's an object lesson of how viewing the world as "good guys vs. bad guys" can lead to a vast oversimplification of a messy story. Global warming has clearly occurred; the hard question is what to do about it. If you missed NEWSWEEK's story, here's the gist. A "well-coordinated, well-funded campaign by contrarian scientists, free-market think tanks and industry has created a paralyzing fog of doubt around climate change." This "denial machine" has obstructed action against global warming and is still "running at full throttle." The story's thrust: discredit the "denial machine," and the country can start the serious business of fighting global warming. The story was a wonderful read, marred only by its being fundamentally misleading. The global-warming debate's great un-mentionable is this: we lack the technology to get from here to there. Just because Arnold Schwarzenegger wants to cut emissions 80 percent below 1990 levels by 2050 doesn't mean it can happen. At best, we might curb emissions growth. But the overriding reality seems almost un-American: we simply don't have a solution for this problem. As we debate it, journalists should resist the temptation to portray global warming as a morality tale -- as NEWSWEEK did -- in which anyone who questions its gravity or proposed solutions may be ridiculed as a fool, a crank or an industry stooge. Dissent is, or should be, the lifeblood of a free society. BRIAN WILLIAMS: We are back with NBC News "In Depth." Here tonight, the heated debate over global warming. Some who used to deny there was any problem at all are now admitting that man is playing a role in climate change, but that is often where the agreement ends. Our chief environmental affairs correspondent Anne Thompson reports tonight on the shifting debate over global warming. ANNE THOMPSON, WITH "IN DENIAL" ON SCREEN: Patrick Michaels drives a hybrid and lights his home with compact fluorescent bulbs, but the climatologist is no global warming advocate. He is proudly a denier. PATRICK MICHAELS, CATO INSTITUTE SENIOR FELLOW: We have taken the word "denier" and broadened it from people who don't believe [in] global warming instead to people who don't believe in the global warming apocalypse. THOMPSON: He agrees man-made pollution warms the Earth but says it won't melt Greenland or raise sea levels to wash away one-third of Florida. MICHAEL OPPENHEIMER, PRINCETON UNIVERSITY: They seem impervious to reason. THOMPSON: Atmospheric scientist Michael Oppenheimer has a more aggressive view. OPPENHEIMER: We don't know all the facts. It could be this bad, it could be this bad. And, you know, honest scientists will tell you there's a range. Trouble with the contrarians is they say there's no range, it's going to be small. THOMPSON: William Reilly was the Environmental Protection Agency administrator for the first President Bush when deniers initially argued man had no role in global warming. But today's science shows otherwise. WILLIAM REILLY, FORMER EPA ADMINISTRATOR: The jury is in to the extent it ever is with respect to a scientific question. There is a consensus on it, and we need to move now to construct policy on the basis of the science. THOMPSON: Getting to that point involved fighting interest groups fueled by powerful companies, including oil giant ExxonMobil. 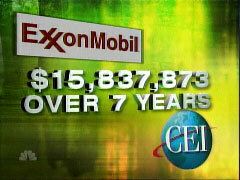 The Union of Concerned Scientists says ExxonMobil gave almost $16 million [$15,837,873] over seven years to denier groups, including the Competitive Enterprise Institute. MARLO LEWIS, COMPETITIVE ENTERPRISE INSTITUTE: We don't take that position because they invest. It's the other way around. And any environmental group that is honest and has any familiarity with us knows that to be the case. THOMPSON: ExxonMobil says it gives to a broad array of groups, and in a statement says, "It is ridiculous to conclude that we or any one of these groups' many supporters control their policy recommendations." Climate experts say whether hired guns or honest dissenters, deniers are confusing the issue and delaying solutions. OPPENHEIMER: This is a problem that needs to be attended to very soon, immediately, or else it threatens to get out of control. THOMPSON: The scientific debate is no longer over society's role in global warming. It is now a matter of degrees. Anne Thompson, NBC News, New York. 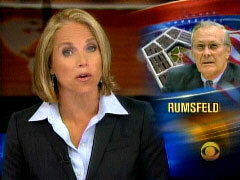 The August 15 AP dispatch, "Rumsfeld resignation letter omits 'Iraq,'" did, however, note a portion Couric skipped over: Rumsfeld cited "the privilege of working so closely with the truly amazing young men and women in uniform." "The word 'Iraq' doesn't appear in former Defense Secretary Donald Rumsfeld's resignation letter. Neither does the word 'war.' In fact, the deadly and much-criticized conflict that eventually drummed him out of office, comes up only in vague references, such as 'a critical time in our history' and 'challenging time for our country,' in the four-paragraph, 148-word letter he wrote to President Bush a day before the Nov. 7, 2006 election." MSNBC's Keith Olbermann, not surprisingly, on Wednesday's Countdown also highlighted Rumsfeld's missing words. Postman clarified in his August 14 "Postman on Politics" blog that "it was only a couple of people who cheered and they, thankfully, are not among the people who get a say in news play. But obviously news staff shouldn't be cheering or jeering the day's news." Chief editor Boardman admonished in the Tuesday e-mail, "As we head into a major political year, now's a good time to remember: Please keep your personal politics to yourself." It's good to learn that Boardman chided his staff for the outburst, but as he admitted, it accurately reflected the political perspective of most journalists. The postings nearly everywhere speak not to the fundamental issues around newsroom decorum, but instead spring from one's place on the spectrum of Bush/Rove "Bad" or Bush/Rove "Good." I ask you all to leave your personal politics at the front door for one simple reason: A good newsroom is a sacred and magical place in which we can and should test every assumption, challenge each other's thinking, ask the fundamental questions those in power hope we will overlook. If we wore our politics on our sleeves in here, I have no doubt that in this and in most other mainstream newsrooms in America, the majority of those sleeves would be of the same color: blue. Survey after survey over the years have demonstrated that most of the people who go into this business tend to vote Democratic, at least in national elections. That is not particularly surprising, given how people make career decisions and that social service and activism is a primary driver for many journalists.